Tenuta del Priore is a family-owned Abruzzese cantina making classic Abruzzo Bianco, Pecorino, Passerina, Montepulciano & Cerasuolo d’Abruzzo wines from 40ha of vineyards near the village of Collecorvino, in the province of Pescara. The vineyards are located high up in sight of the Adriatic Sea, on calcareous clay soils rich with (calc) stones among the Colline Pescaresi. The property has been owned by the Mazzocchetti family for many generations, who started bottling their wines in 1973. Fabrizio Mazzocchetti (pictured left) is the latest generation to assume responsibility for the estate, along with his father Antonio. Notably Fabrizio learned his trade outside Abruzzo, attending wine school in Florence before honing his (white) wine-making skills in Alto Adige at the the famous San Michele Appiano cantina, Bolzano. Fabrizio’s first vintage was in 2001 & since then he has worked hard to fine-tune the viticulture & vinification. Giovanna Fabrizii, Fabrizio’s wife, has now happily joined! They are justly proud of their ‘Campotino’ range of wines, that delivers high quality, terroir expressive, affordable drinking. The whites (Abruzzo Bianco, Pecorino & Passerina) are expertly made to give clear fruit expression & a sense of place, without the use of oak; as does the rosato Cerasuolo d’Abruzzo & the inky purple Montepulciano d’Abruzzo; refined in cement tanks. 2018 Abruzzo Bianco ‘Campotino’, Colline Pescaresi IGT, Collecorvino – tasted March’19, 13%, pale citrus white, immediate whiff of the mare Adriatico, with this breezy bright, racy, lime-stone, pith, grassy, crystal clear notes; proof of the benefit of the blend, here 50% Trebbiano, 30% Passerina, 20% Fiano. The Trebbiano gives the raciness; the Passerina the suave pretty fruit; the Fiano a bit of lemon pith structure. Indeed it’s very lemon pithy, with a quasi Melon de Bourgogne/Muscadet salinity; the palate is light but not vacuous, pebbly greengage fruit abound, briny, stone fruit, bright, immensely drinkable as an Aperitivo or with fish antipasti. Delizioso, a real taste of the Adriatic! Simplest is best?! 2018 Passerina ‘Campotino’, Colline Pescaresi IGT, Collecorvino – tasted March’19, 13%, more intense in colour, it follows that the nose is more textured, singular, more obvious lemon, soapstone, pulpier; the palate ditto, oranges & lemons, suave, flowing, beady white (currant) fruit, that Adriatic salty spine, yet juicy, fresh clementine fruit! 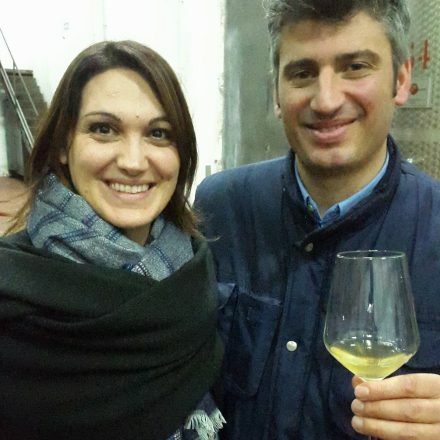 2018 Cerasuolo d’Abruzzo ‘Campotino’, Collecorvino – tasted March’19, salmon pink, bright, peach skin & seasalt, lots of pretty, little red fruit, with a ‘Campari-soda’ bitter orange palate! Very bright & simple. 2018 ‘Col del Mondo’ Abruzzo Bianco ‘Sunnae’, Colline Pescaresi IGT, Collecorvino – tasted March’19, 13.5%, compared to the ‘Campotino’ version, Fabrizio’s Col del Mondo expression is overall riper & more polished, perhaps benefitting from the older vines, lower guyot trellised yields & the substitution of the Fiano with Pecorino! More intense lemon gold, the ‘Sunnae’ is more lemongrass, lime cordial even, still crystal clear & racy (Trebbiano! ), there’s a juicy sense of greengage fruit, of sapid, marine salt, lime, & perhaps some white pepper on the finish. Impressive, & still grounded. 2018 ‘Col del Mondo’ Pecorino ‘Kerrias’ – tasted April 2019, 14% abv. Richer, rounder and more complex than its ‘Campotino’ counterpart. Perfectly ripe fruit, which means a fraction more alcohol, but with low pH. The vines are 200m asl. As the Pecorino ripens 1 month earlier than the Montepulciano (usually harvested by September at the latest), it benefits from Northern exposure, allowing for slower ripening. The terroir is calcareous and rich in minerals, giving a complex wine, that has a weighty and expansive mid-palate, with waxy lemon, citrus, and stone fruit, a hint of quince, and lovely purity. 100% stainless steel, with 4 months in cement tanks on fine lees. Lingering salinity on the finish – this is more of a food wine than the entry level Pecorino. It’s weight and texture would pair well with cheeses and fish or chicken dishes with creamy sauces. 2016 ‘Col del Mondo’ Montepulciano d’Abruzzo Terre dei Vestini, Collecorvino – Tasted April 2019. 2016 was a cool vintage, similar to 2018. Fruit from Fabrizio’s oldest Montepulciano vines, high up on the hills (300m asl), a land once occupied by the Vestini tribe who fought running battles with the Romans around the 4th century BC. This is the wine that Fabrizio feels champions the Tenuta del Priore and Col del Mondo terroir (calcareous, clay and marl, rich in morainic material). The wine has 1 yr in barrique adds some complexity, gently sculpting and refining the tannins. Dark cherry, blackberry, liquorice and prune. Much fuller and more serious than its ‘Campotino’ counterpart.